~~> Mary Moh, Sonia, Sook, Biren, Ann, Joy, Wendy, Anncoo, Jess, Zoe, Pete, Quay Po, Sook, Tracie Moo, Kimberly, DG, Gert, Tigerfish, Tummy, my silent readers, visitors and to the entire world! Thank you so much for remembering me :) I miss all the festivities in Malaysia. Enjoy the holidays and visiting your Chinese friends. 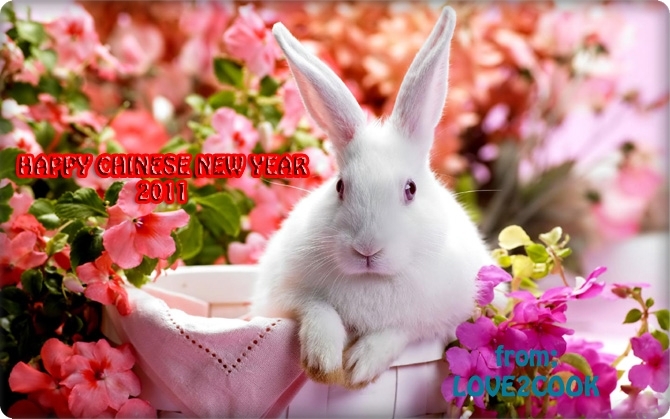 Have a Great Year of the Rabbit Ahead! Wishing you a fabulous year ahead..